I love the fall season - not only because of all the gorgeous colors on trees but also because I get to indulge in rich, comforting foods. As I've mentioned before, squash is a favorite seasonal vegetable of mine and any dishes that incorporate it make my mouth water. So when I saw the following recipe in Martha Stewart's Everyday Food mag (November edition), I just had to try it. Using fresh ingredients such as butternut squash, sage and good cheese, it's hard to go wrong when making this--especially on cold, rainy nights. The preparation could get a bit messy but in the end it's worth it. I'd like to incorporate meat next time (maybe turkey), as this was a purely vegetarian dish. A way I changed it is that I substituted whole wheat pasta for plain white. Try it and tell me how you like it. Preheat oven to 350 degrees. Lightly oil a 2 quart or 8 inch square baking dish. In a large pot of boiling salted water, cook pasta until al dente. Using tongs, transfer pasta to a lightly oiled rimmed baking sheet. Add squash to boiling water and cook until tender, about 10 minutes. Drain squash and transfer to a bowl. In a small skillet, heat 1 tbs of oil over medium heat. Add shallots, season with salt and pepper, and cook until soft, about 5 minutes. Transfer to bowl with squash and add 2 tbs milk, chopped sage, and nutmeg; season with salt and pepper. Mash with fork until a rough puree forms. Spread 1/4 cup squash mixture cross-wide down the middle of each lasagna noodle; roll up noodle and place, seam side down, in baking dish. In a bowl, combine ricotta, 1/2 cup parmesan, and 1/4 cup of milk and season with salt and pepper. 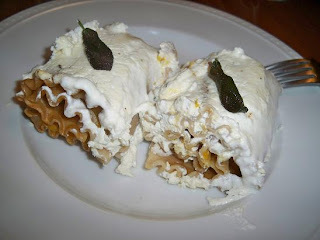 Spread ricotta mixture over cannelloni and top with 1/4 cup parmesan. Bake until warmed through, about 25 minutes. Broil until top is browned, 2 to 3 minutes. Meanwhile in a small skillet, heat 2 tbs of oil over medium-high heat. Fry whole sage leaves until crispy, 15 to 20 seconds. Drain on paper towels. 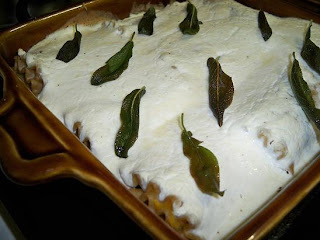 Serve cannelloni with fried sage.